Most people in the world today know what a curry is - or at least they think that. Curry is a concept rather than a strict recipe and is no particular ingredient that makes "curry." It can be customized when you use the different local spices. Even though the same meats and vegetables are used in the curry, tastes completely different in every region. The curries are mainly eaten with rice, breads (like naan or ciapati), poppadum (fried or baked crispy bread made from chick peas flour or chana) or potatoes and served on the side with pickles or chutney. No curry is truly complete without onions, garlic, chili and ginger. These four ingredients are always best used fresh. Onions are always finely chopped and sautéed until translucent or brown in the beginning in any curry. Ginger is usually grated or chopped very fine and garlic can be sliced or crushed.The level of heat is given by the amount and the type of chili we use. Dry chili can be used instead. The heat level of fresh chilies is reduced with the length of cooking so add them earlier if you like it milder and later if you prefer it hotter. In India, the curry is flavored with spices like clove, cinnamon, nutmeg, anise, bay leaf, coriander, cumin, cardamom, fenugreek, curry leaves and turmeric. In Pakistan they flavor the curry, which is either mutton or chicken, with masalas powder, garlic, vinegar, cumin, turmeric, tomatoes and coriander. Chinese curry is more watery and can be made with all kinds of meats, all kind of vegetables in a mildly spicy yellow curry sauce, and served with stir fry vegetables over steamed rice or noodles. Soy sauce, hot sweet chili sauce, may be added to the sauce to enhance the flavor of the curry. In Japan and Korea curry is considered to be a Western dish. It is usually eaten with rice and pickled vegetables, like pickled ginger or pickled daikon -white radish. Malaysian curries typically use curry powders rich in turmeric, tamarind, coconut milk, ginger, shrimp paste, and garlic. In Malaysian curry all kind of things can be use including lamb, chicken, shrimp, with aubergine, boiled eggs, and vegetables. In Thai cuisine, curry it’s a dish with a sauce based on a paste made with local ingredients such as chili peppers, kaffir lime leaves, lemon grass, galangal and coconut milk. Thai curries tend to be more aromatic than Indian curries. In the West, Thai curries are described by color. Red curries use red chilies while green curries use green chilies. Yellow curry is use to make "curry soup" and is more similar to Indian curries, with the use of turmeric and cumin. In the UK’s ''curry" is one of the most popular dishes. Curry in UK means that a meat, vegetable or fish dish is cooked in a spicy sauce and served with rice or bread.In 1390 the first English cookery book was written, called ‘The Forme of Cury’. ‘Cury’ was the Old English word for cooking or boiling.So when the English merchants landed in India in 1610, the word ‘cury’ had been part of the English language for over two hundred years.Whatever the real Indian, ‘curry’ was rapidly adopted in Britain cuisine.They own creations and most well know curry in the UK is chicken tikka masala. Here is my favorite version of Rogan Josh and this one is made by me many times with great success. Rogan Josh is one of the most important curries of India and is very easy to make. This Rogan Josh is a proper curry made from scratch without curry paste from market, with lots of flavor and creaminess from the yoghurt. The nice mix of spices like cardamom, cinnamon, cumin, chili and ginger, turns the lamb into an aromatic fiesta. Marinate the cubed lamb meat with all the marinate ingredient and leave them aside for minimum 2 hours (or overnight.). In a large saucepan heat the oil in a heavy-based pan. Tip in the cinnamon sticks, bay leaves cardamoms seeds, cumin seeds and dry chili flakes. When they sizzle (make sure they don't burn) add the garlic and the onion and fry until the onions are nicely caramelized. Add the lamb and fry for 5 to 7 minutes until it changes color. Pour in 500 ml of lamb stock, cover and simmer on a low heat for 40 minutes until the meat is tender. The mixture can be frozen at this stage. Defrost thoroughly before reheating and bring to the boil.Remove the lid and stir in the tomato puree and mix. Add the salt, yogurt, lemon juice, sugar and cook for 10 more minutes. When the oil rise to the top of the saucepan means the curry is ready. Stir in the coriander leaves. Just before serving you could garnish it with chopped coriander leaves. Serve with Basmati rice, wild rice, Bombay potato, chutney (recipe here) and poppadum. 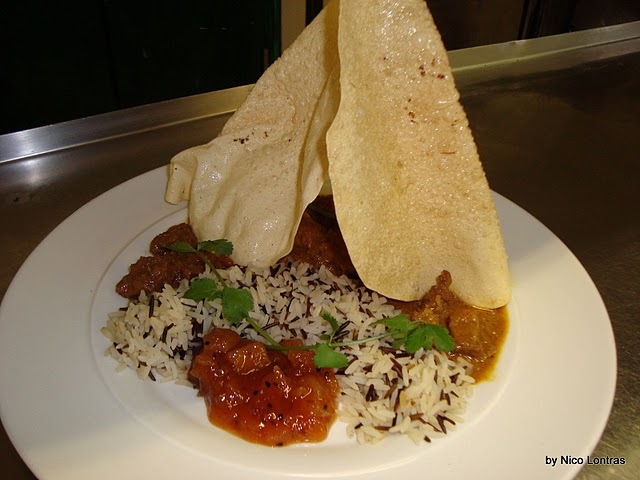 Here the lamb Rogan Josh is served with wild rice, popadomus and mango chutney. Here I made the curry with Wild board and served with rice, red curant chutney and fresh mint leaves. Here is my way of Thai chiken curry served with rice and spice banana. More recipe of diferent curry soon. Super prezentarea ta despre curry. Pregatit asa mielul trebuie sa fie o minunatie. Si totusi, eu astept retete pentru alte curry-uri, ca nu mananc miel.